It’s nearly worth forgiving Ben Affleck’s work in front of the camera because of his achievements behind it … nearly. He wasn’t given the praise he deserved for his directorial debut Gone Baby Gone, which in my opinion was the best film of 2007. He followed with The Town in 2010, which wasn’t as powerful but impressive none the less. With his third feature film, Affleck has risen from just another actor “stepping behind the camera” to a serious Hollywood talent. I’d be very surprised if he isn’t nominated for Best Director with Argo, and if he doesn’t, I would put money on him winning the same category within ten years. 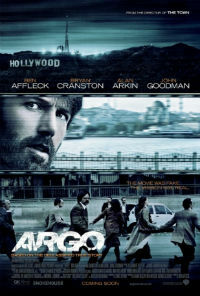 Unlike his first two films, which were based on novels, Argo is based on a true story. It’s the factual account of how a CIA operative (Affleck) helped six American citizens escape a hostile Iran during the late ‘70s. The plan was for the operative to fly into Iran as a pretend film producer, scouting his next film location, and then fly out with the six citizens as his production crew. The entire film plays out like a jailbreak movie, with Affleck devising the plan and making sure all the pieces fall into place. The plan itself is as brilliant as it is bizarre, and the fact that it’s true makes it even more interesting. One of the reasons I enjoyed Gone Baby Gone so much is because Affleck didn’t cast himself , but had his younger brother (and better actor) Casey Affleck in the lead role. Ben played the lead in The Town, but had a strong supporting cast in Jeremy Renner and Jon Hamm. Affleck has once again cast himself as the lead in Argo, but it doesn’t affect the movie as much as you’d think. To be honest, Affleck’s face on the poster nearly put me off seeing it, until I noticed he was also attached as director, which is saying a lot for his past work. He brings another incredible supporting cast to Argo. Bryan Cranston (Breaking Bad) plays the CIA superior, Alan Arkin and John Goodman play Hollywood hotshots helping to make the fake film credible, and the American civilians are all relatively familiar faces (especially the dude with the sweet moustache, who is actually Lucas from Empire Records). Because Argo is based on a true story, there are no major twists or turns along the way. It’s interesting because it actually happened, and Affleck has done incredibly well to make it so gripping. But it does tend to get quite slow and boring in places. Don’t watch this if you’re expecting a thrilling drama or violent war film. Another problem with being a true story is that Affleck is unsure whether to present it as a serious or semi-comical retelling of events. He switches between intense political drama and light-hearted laughs too often, making it hard to feel scared for the citizens trapped in a warzone, especially when the characters in Hollywood are still making cheap one-liners and drinking scotch. Argo is not your typical Hollywood blockbuster, but that’s a good thing.